This outdoor jacket is a MINI must-have and features stylish and functional highlights. It is cut for a comfortable, modern fit and has elastic drawstrings on the hem and hood for an individual fit. Wind and water repellent material, printed with the MINI Wing Logo on the left sleeve make this jacket a perfect companion for urban outdoor adventures. 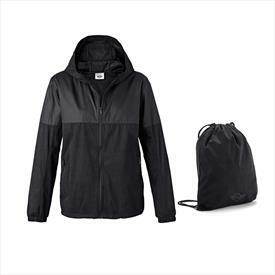 This jacket includes a drawstring backpack. Drawstrings for an individual fit. Fits true to size.